Veterinary technician anesthetists are specially trained and certified to assist veterinary anesthesiologists and surgeons with procedures. Veterinary technician anesthetists assist veterinarians with surgical procedures performed on a variety of animals. Routine tasks may include pre-anesthetic preparation, evaluating patients, giving fluids, administering anesthesia, managing ventilation, maintaining sedation, monitoring emergence from anesthesia, post-anesthesia care, and performing equipment maintenance. Vet techs, including anesthetists, may be required to some work nights or weekends depending on the schedule of their clinic or the attending veterinarian. They must also take precautions to minimize the potential for injury from animals that are in the process of being sedated. Veterinary technician anesthetists most frequently find employment with veterinary clinics, hospitals, and emergency clinics. They may also find positions in some zoos, animal parks, marine parks, and research labs. Techs may specialize by working with a specific category of patients such as small animals, large animals, equines, or exotics. Some veterinary technicians choose to move into other positions in the animal health industry, such as veterinary equipment sales or veterinary pharmaceutical sales. Anesthesia technicians are particularly well suited to market surgical equipment and devices, particularly anesthesia devices. There are over 160 accredited veterinary technician programs in the United States that can grant two-year Associate degrees to their successful graduates. After graduation from an accredited program vet techs must also pass a licensing examination in their state of residence. State certification is granted through the Veterinary Technician National Exam (VTNE), though some states may have some varying additional requirements. The National Association of Veterinary Technicians in America (NAVTA) is the certification authority that recognizes 11 veterinary technician specialist (VTS) certification areas. The currently recognized specialties for veterinary technicians include anesthesia, surgical, dental, internal medicine, emergency & critical care, behavior, zoo, equine, clinical pathology, clinical practice, and nutrition. The Academy of Veterinary Technician Anesthetists (AVTA) offers VTS specialty certification to licensed vet techs that have completed at least 6,000 hours (3 years) of vet tech experience, with at least 75 percent of that time (4500 hours) spent administering anesthesia and related care. Additional requirements to sit for the exam include completion of at least 50 cases during the year of application, four detailed case reports, 40 hours of documented continuing education within the past five years, completion of an advanced anesthesia skills checklist, and two letters of recommendation. Veterinary technicians meeting these rigorous requirements are eligible to take the AVTA certification exam that is administered once each year. Veterinary hospitals may prefer to hire candidates who hold specialty certification in the field of anesthesia, as these individuals will have advanced skill and significant training in the field. According to the employment site Indeed.com, vet tech anesthetists earned an average salary of $45,000 in 2012. This is quite a bit higher than the $30,290 ($14.56 per hour) mean annual wage for all veterinary technicians reported by the BLS in 2012. The BLS also reported that the lowest 10 percent of all techs earned less than $21,030 per year, while the highest 10 percent of all techs earned more than $44,030 per year. 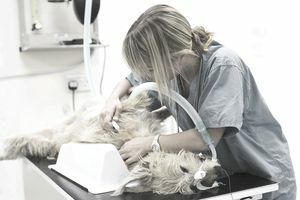 Benefits for vet tech anesthetists may include salary, medical insurance, dental insurance, paid vacation days, a uniform allowance, or discounted care for the tech’s animals at their home clinic. As with any position, salary is commensurate with the level of experience and level of education. Specialists usually can command the top end salaries due to their advanced levels of expertise. According to the Bureau of Labor Statistics, there were 84,800 vet techs employed during the most recent salary survey of 2010. The BLS projected a steady annual increase of veterinary technicians, with approximately 4,000 new licensees expected to enter the field each year. The BLS also projects that the rate of expansion for the profession will expand much more quickly than the average for all professions at a rate of 30% (from 2012 to 2022). The limited supply of new techs entering the field, combined with the even smaller number of techs that will achieve specialty certification in anesthesia, should result in very strong job prospects for certified vet tech anesthetists.